Václav Havel grew up in a well-known entrepreneurial and intellectual family, which was closely linked to the cultural and political events in Czechoslovakia from the 1920's to the 1940's. For political reasons he was not accepted into any post-secondary school with a humanities program, and yet the intellectual tradition of his family compelled him to pursue the humanitarian values of Czech culture, which were harshly suppressed in the 1950's. As time went on, he became more politically active and helped found several dissident initiatives against the Communist government. Havel's Civic Forum party played a major role in the Velvet Revolution that toppled communism in Czechoslovakia in 1989. He assumed the presidency shortly thereafter as the ninth president of Czechoslovakia, and was reelected in a landslide in the following election becoming the first president of the Czech Republic after Slovak independence in 1993. Havel was a writer and dramatist; a playwright, essayist, poet, philosopher, dissident and statesman. His political philosophy was one of anti-consumerism, humanitarianism, environmentalism, civil activism and direct democracy. Václav Havel’s New Year’s Address to the Nation, 1990, captured the attention of people around the world for its frankness and honesty. 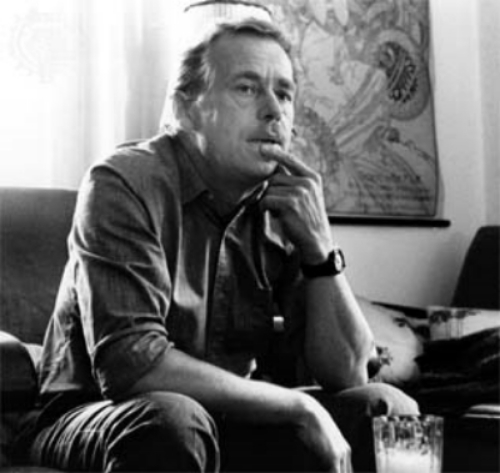 The people of Czechoslovakia had just risen up and peacefully turned out the Communist government, and Havel, the president of the fledgling Czech Republic had the responsibility to set the new state on a rightful path. For Havel, that path begins from a place of responsibility, and he remarks to the Czech people he is addressing: “I assume you did not propose me for this position so that I too would lie to you.” referring to speeches made prior to his election that claimed that the state of Czechoslovakia was flourishing. The state was not flourishing, rather it had diminished substantially under the totalitarian regime of the previous forty years. And this, Havel says, is because “we live in a contaminated moral environment. We fell morally ill because we became used to saying something different from what we thought. We learned not to believe in anything, to ignore one another, to care only about ourselves.” Havel goes on to say that the responsibility for all those years and abuses against individuals, society and nature belonged to each person, “We cannot blame the previous rulers for everything, not only because it would be untrue, but also because it would blunt the duty that each of us faces today: Namely the obligation to act independently, freely, reasonable and quickly.” His speech is an accounting and a call to action and responsibility.